This cross-section of the Sun shows a crucial region called the convection zone. This zone extends from approximately 125,000 miles inside the Sun all the way out to its edge and is where energy created from nuclear reactions happening within the Sun's core radiate outward into space. The Sun likely containsnearly three times more neon than previously thought, according to a new study. The finding, if shown to beaccurate, solves a theoretical problem regarding how stars in general work. The question of the Sun'sneon abundance has been a sensitive topic among astronomers in recent years. "Understanding the waythe Sun works is the bottom rung in a ladder to understanding how the rest ofthe universe works," said Jeremy Drake of the Harvard-Smithsonian Centerfor Astrophysics. In the past, astrophysicistsbased their solar model on data collected from studies that measured the waypressure waves propagate throughout the Sun. The model was put intoquestion, however, when their value for the neon abundance in the Sun differedfrom those calculated using other techniques. One of these techniquesinvolved capturing particles from the solar wind, a stream of charged particlesthat continuously streams from the Sun, and tallying up the total number andtype of atoms present from each element. Another involved X-rays;neon does not appear in the visible spectrum of light but it shines brightly inX-rays. Based on these techniques,astronomers came up with a value for the Sun's neon concentration that differedfrom the value used in the astrophysicist's model by a factor of three. "When astrophysicistsplugged in these new values, their model broke," Drake said. Drake said the disagreementabout the concentration of neon may have been due to problems with both thesolar wind technique and the X-ray method. In the case of the solarwind, the Sun accelerates a particle differently depending on its mass andcharge -- things that vary from element to element. With X-rays, the problem isone of distance. Because Earth is so close to the Sun, relatively speaking,scientists can't look at the solar furnace in its entirety, and must insteadsettle for examining different parts separately. When viewed from such aclose distance, different elements appear in different concentrations indifferent parts of the Sun, Drake explained, and it is difficult to say whicharea, if any, is an accurate representation of the Sun's chemical makeup. 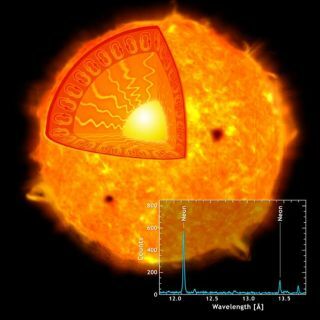 Drake and his colleaguePaola Testa from the Massachusetts Institute of Technology got around theseproblems by measuring the neon abundance of 21 nearby Sun-like stars usingNASA's Chandra X-ray Observatory. By stepping back, theymeasured the average X-ray emission from the stars. What the researchers foundwas that the nearby stars contained three times more neon than was calculatedfor the Sun. The implication was clear. "Either the Sun is a freak in its stellar neighborhood, or it contains alot more neon than we think," said Paola Testa from MassachusettsInstitute of Technology and another study team member. Drake said the sametechnique could be used on our own Sun, if not for one problem: the detectorson Chandra's instruments would fry because of the heat. The study is detailed in theJuly 28 issue of the journal Nature.